The pressure gauge is fully electronic and displays the measured air pressure on a four digit LCD display. 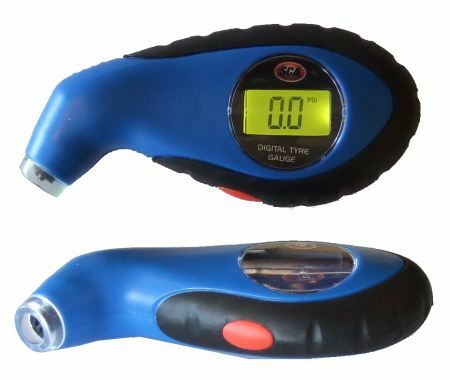 Unlike other models, both the LCD display and measurement tip are illuminated by LEDs, to help you easily find the valve stem on your tyre and read the LCD display at night time, or in a dimly lit garage where it’s dark. It supports all common units of air pressure including Pounds per Square Inch (PSI), Kilopascals (kPa), Bars and Kilogram Force per Square Centimetre (Kg/cm2). According to online specifications, the digital air pressure gauge is accurate to 0.5 PSI (3.45 kPa / 0.034 bars / 0.035 kgcm-2). It weighs 61g (2.15oz) and measures 10.8cm × 4.85cm × 2.3cm (4.25in x 1.91in x 0.91in), so it is compact enough to stash in your car glovebox or cycling backpack. I purchased it from Supercheap Auto for $19.99. Identical digital air pressure gauges are available on eBay for $10 or less, marked with the brand names “Jinmao” and “Airsoon”. The only difference I can see is that most of the ones on eBay are yellow instead of blue.